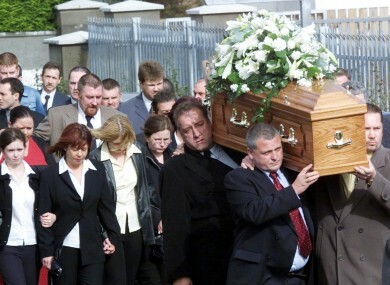 The funeral procession of Sunday World journalist Martin O'Hagan in October 2001. TODAY THE OSCE’s representative on Freedom of the Media urged UK authorities to re-launch a criminal investigation into the murder of Northern Irish journalist Martin O’Hagan 13 years ago. O’Hagan, a reporter for the Sunday World, was shot in September 2001 while walking with his wife near his home in Lurgan. No one has ever been charged with his murder, though the Sunday World has claimed Ulster paramilitary forces were behind it. In a statement today, Dunja Mijatović said it is “unacceptable” that so much time has passed and not one person has been held responsible for what he called “a public execution”. “The failure to prosecute can create an environment of impunity for those who might attack journalists,” he said. The National Union of Journalists welcomed his comments with General Secretary Michelle Stanistreet commenting that they serve “as a timely reminder of the failure of the PSNI to secure a conviction for the murder of a journalist of commitment, courage and integrity”. Email “Call for re-investigation of Sunday World journalist's 'public execution' ”. Feedback on “Call for re-investigation of Sunday World journalist's 'public execution' ”.